Pork Menudo with Hotdog is a yummy version of menudo. It has the same good taste with the addition of sliced hotdogs. It is made a bit sweeter by adding a teaspoon of sugar. I think that this is a winner. Pork Menudo is a type of Filipino pork stew. 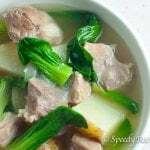 It is commonly cooked with pork liver, but it can be omitted, if you are not a fan of it. 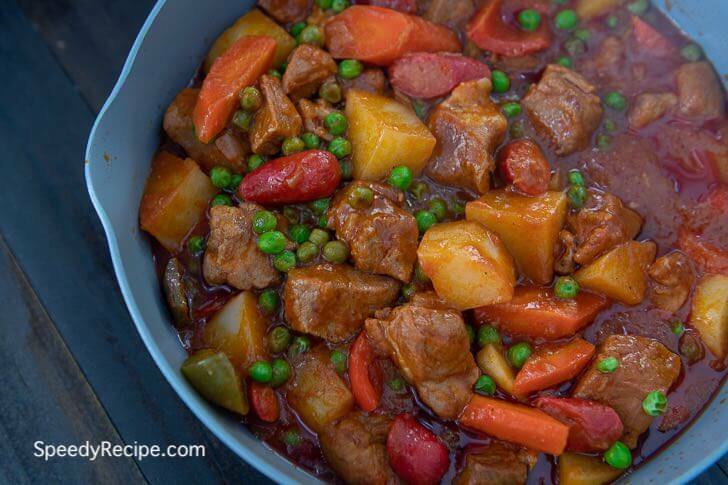 This stew is part of the center table during special occasions. The Philippines has a series of Fiesta’s in different towns and this dish is usually present especially if the event is somewhere near Metro Manila. Try this Pork Menudo with Hotdog Recipe. Enjoy! Stir-fry (or pan-fry) the potato and carrot for 3 minutes. Set aside. Using the same pan, heat the remaining oil. Add more if needed. Saute onion and garlic until the onion gets soft. Add the pork. Saute for 2 minutes. Stir-in the liver; saute for 2 minutes. Add the hotdogs. Stir. Pour-in tomato sauce and beef broth; stir and let boil. Cover and cook in low heat until the pork gets tender. Add sugar, ground black pepper, and salt. Stir. Put-in the fried potato and carrot and cook for 2 to 3 minutes. Serve! It looks fantastic! I do the same steps when cooking Menudo but use beef powder and water as I find packaged beef broth to be more expensive. Hi Gerard – Thanks! I like using beef powder and beef cube sometimes too.